Sail the Columbia and Snake Rivers on this innovative river boat! American Cruise Lines is launching an all-new series of American-built modern riverboats, and American Song is the leader of the pack. Launched in 2018, American Song is the newest and most modern boat in American Cruise Lines’ fleet. After her inaugural season on the Mississippi River, she will sail the Columbia and Snake Rivers beginning in 2019. 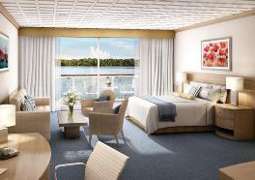 American Song represents a new era of river cruising. With all-balcony staterooms and extra-spacious lounges, she’s designed with passenger comfort in mind. An innovative four-story glass atrium serves as the central gathering point of the ship, with a domed ceiling and glass skylight to let in natural light. The ship is structured in a way to bring passengers closer to nature, with glass walls and enclosed balconies blurring the line between inside and out. State-of-the-art stabilization technology and modern propulsion systems guarantee passengers a smooth ride, and American Song also produced less pollution than other similar American river ship. Staterooms on the American Song are spacious, comfortable, and designed with passenger needs in mind. The all-balcony, all-River View rooms come with a separate sitting area, free Wi-Fi, and a satellite TV. 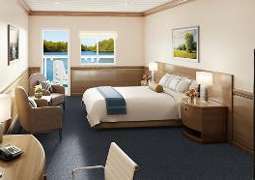 Standard staterooms start at a spacious 304 square feet, and veranda suites start at 405 square feet. The first-ever Grand Suite can also be found on this ship. At 900 square feet, the Grand Suite is the size of a small house. Floor-to-ceiling windows and a sliding glass door lead out to a private wrap-around balcony, the perfect spot to enjoy a nice breakfast and start the day off right. Some staterooms on the American Song are wheelchair-accessible, and some single staterooms are available for solo passengers. American Song serves regionally-inspired cuisine, with menus designed by highly trained chefs. Expect lots of regionally-inspired dishes on your cruise, including locally-sourced seafood such as salmon, shrimp, and crab. The culinary experts onboard are happy to cater to every preference and dietary need. Soft drinks, beer, and wine are available during meals, and there’s also a cocktail happy hour between meals included in the cost of your cruise. Your Columbia River cruise isn’t just a relaxing vacation – it’s an educational journey as well. You’ll sail in the wake of Lewis and Clark and the Corps of Discovery on the final leg of their journey to reach the Pacific Ocean. An onboard historian will entertain you with tales of early explorers and the Native American tribes they encountered, and shore excursions will be themed around the unique history and geography of the region. You’ll sail from the arid lowlands of Eastern Washington, through the alpine forests of the Cascade Mountains, on to the distinctive cities of Portland and Astoria, stopping at historical sites, vineyards, and active volcanoes as you go. A Columbia River cruise is the perfect way to immerse yourself in the natural beauty of the Pacific Northwest. American Cruise Lines recommends bringing weather-appropriate clothing and comfortable footwear on your river cruise. Smart-casual dress is recommended for dinner and may include sweaters, slacks, a sports jacket or skirt.